Large retailers in the New Zealand market are losing millions of dollars in profits each year due to box cutters, according to documented studies conducted by ADCO Industries and Shockwatch New Zealand. These studies provide evidence that a minimum of one half of 1% of all retail merchandise is damaged by a box knife, resulting in lost profits for retailers. And until now, retailers couldn’t do anything about it. The tools on the market available to retailers, prior to the Easy Cut line of cutters, put the responsibility to prevent damage squarely on the stocker’s shoulders. The box cutter itself provided minimal value to prevent product damage. The patented Elite Easy Cut 1500, recently released from ADCO and sold in New Zealand by Shockwatch New Zealand, is the ultimate in box cutter technology that eliminates box cutter problems for retailers. Easy Cut 1500 allows any stocker, regardless of experience or whether he cuts above or below the product, to open any box without damaging the product inside. Among the “exclusive” features of the Elite Easy Cut 1500 that make this possible are a precise engineered blade setting and a spring blade retraction system that automatically retracts the blade when not in use, providing added protection to the user. Easy Cut has also proven to increase productivity by as much as 20%. The cutter requires half the energy to cut boxes, while the blade lasts 60% longer than standard blades. 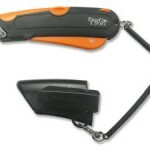 Easy Cut’s patented holster/lanyard system keeps the cutter safely in place when not in use, and has proven to reduce replacement purchases by as much as 40%.